For the British musician, see Larry Page (singer). Page is the inventor of PageRank, a well-known search ranking algorithm for Google. Page received the Marconi Prize in 2004 with Brin. Page was born on March 26, 1973, in East Lansing, Michigan. His mother was Jewish, and his maternal grandfather later made aliyah to Israel, but Page does not declare to follow any formal religion. His father, Carl Victor Page, Sr., earned a PhD in computer science from the University of Michigan, when the field was being established, and BBC reporter Will Smale has described him as a "pioneer in computer science and artificial intelligence". He was a computer science professor at Michigan State University and Page's mother, Gloria, was an instructor in computer programming at Lyman Briggs College and at Michigan State University. During an interview, Page recalled his childhood, noting that his house "was usually a mess, with computers, science, and technology magazines and Popular Science magazines all over the place", an environment in which he immersed himself. Page was an avid reader during his youth, writing in his 2013 Google founders letter: "I remember spending a huge amount of time pouring [sic] over books and magazines". According to writer Nicholas Carlson, the combined influence of Page's home atmosphere and his attentive parents "fostered creativity and invention". Page also played flute and studied music composition while growing up. He attended the renowned music summer camp - Interlochen Arts Camp at Interlochen, Michigan. Page has mentioned that his musical education inspired his impatience and obsession with speed in computing. "In some sense, I feel like music training led to the high-speed legacy of Google for me". In an interview Page said that "In music, you're very cognizant of time. Time is like the primary thing" and that "If you think about it from a music point of view, if you're a percussionist, you hit something, it's got to happen in milliseconds, fractions of a second". Page was first attracted to computers when he was six years old, as he was able to "play with the stuff lying around"—first-generation personal computers—that had been left by his mother and father. He became the "first kid in his elementary school to turn in an assignment from a word processor". His older brother also taught him to take things apart and before long he was taking "everything in his house apart to see how it worked". He said that "from a very early age, I also realized I wanted to invent things. So I became really interested in technology and business. Probably from when I was 12, I knew I was going to start a company eventually." Page attended the Okemos Montessori School (now called Montessori Radmoor) in Okemos, Michigan, from 1975 to 1979, and graduated from East Lansing High School in 1991. He attended Interlochen Center for the Arts as a saxophonist for two summers while in high school. Page holds a Bachelor of Science in computer engineering from the University of Michigan, with honors and a Master of Science in computer science from Stanford University. While at the University of Michigan, Page created an inkjet printer made of Lego bricks (literally a line plotter), after he thought it possible to print large posters cheaply with the use of inkjet cartridges—Page reverse-engineered the ink cartridge, and built all of the electronics and mechanics to drive it. Page served as the president of the Beta Epsilon chapter of the Eta Kappa Nu fraternity, and was a member of the 1993 "Maize & Blue" University of Michigan Solar Car team. As an undergraduate at the University of Michigan, he proposed that the school replace its bus system with a PRT System which is essentially a driverless monorail with separate cars for every passenger. He also developed a business plan for a company that would use software to build a music synthesizer during this time. After enrolling in a computer science PhD program at Stanford University, Page was in search of a dissertation theme and considered exploring the mathematical properties of the World Wide Web, understanding its link structure as a huge graph. His supervisor, Terry Winograd, encouraged him to pursue the idea, and Page recalled in 2008 that it was the best advice he had ever received. He also considered doing research on telepresence and autonomous cars during this time. Page focused on the problem of finding out which web pages linked to a given page, considering the number and nature of such backlinks as valuable information for that page. The role of citations in academic publishing would also become pertinent for the research. Sergey Brin, a fellow Stanford PhD student, would soon join Page's research project, nicknamed "BackRub." Together, the pair authored a research paper titled "The Anatomy of a Large-Scale Hypertextual Web Search Engine", which became one of the most downloaded scientific documents in the history of the Internet at the time. ... entire Web was loosely based on the premise of citation—after all, what is a link but a citation? If he could devise a method to count and qualify each backlink on the Web, as Page puts it "the Web would become a more valuable place." At the time Page conceived of BackRub, the Web comprised an estimated 10 million documents, with an untold number of links between them. The computing resources required to crawl such a beast were well beyond the usual bounds of a student project. Unaware of exactly what he was getting into, Page began building out his crawler. The idea's complexity and scale lured Brin to the job. A polymath who had jumped from project to project without settling on a thesis topic, he found the premise behind BackRub fascinating. "I talked to lots of research groups" around the school, Brin recalls, "and this was the most exciting project, both because it tackled the Web, which represents human knowledge, and because I liked Larry." To convert the backlink data gathered by BackRub's web crawler into a measure of importance for a given web page, Brin and Page developed the PageRank algorithm, and realized that it could be used to build a search engine far superior to existing ones. The algorithm relied on a new technology that analyzed the relevance of the backlinks that connected one web page to another. Combining their ideas, the pair began utilizing Page's dormitory room as a machine laboratory, and extracted spare parts from inexpensive computers to create a device that they used to connect the not nascent search engine with Stanford's broadband campus network. After filling Page's room with equipment, they then converted Brin's dorm room into an office and programming center, where they tested their new search engine designs on the Web. The rapid growth of their project caused Stanford's computing infrastructure to experience problems. Page and Brin used the former's basic HTML programming skills to set up a simple search page for users, as they did not have a web page developer to create anything visually elaborate. They also began using any computer part they could find to assemble the necessary computing power to handle searches by multiple users. As their search engine grew in popularity among Stanford users, it required additional servers to process the queries. In August 1996, the initial version of Google, still on the Stanford University website, was made available to Internet users. BackRub already exhibited the rudimentary functions and characteristics of a search engine: a query input was entered and it provided a list of backlinks ranked by importance. Page recalled: "We realized that we had a querying tool. It gave you a good overall ranking of pages and ordering of follow-up pages." Page said that in mid-1998 they finally realized the further potential of their project: "Pretty soon, we had 10,000 searches a day. And we figured, maybe this is really real." In 1440, Johannes Gutenberg introduced Europe to the mechanical printing press, printing Bibles for mass consumption. The technology allowed for books and manuscripts – originally replicated by hand – to be printed at a much faster rate, thus spreading knowledge and helping to usher in the European Renaissance ... Google has done a similar job. The comparison was also noted by the authors of The Google Story: "Not since Gutenberg ... has any new invention empowered individuals, and transformed access to information, as profoundly as Google." Also, not long after the two "cooked up their new engine for web searches, they began thinking about information that was at the time beyond the web," such as digitizing books and expanding health information. Soliciting funds from faculty members, family and friends, Brin and Page scraped together enough to buy some servers and rent that famous garage in Menlo Park. ... [soon after], Sun Microsystems co-founder Andy Bechtolsheim wrote a $100,000 check to "Google, Inc." The only problem was, "Google, Inc." did not yet exist—the company hadn't yet been incorporated. For two weeks, as they handled the paperwork, the young men had nowhere to deposit the money. While Google is often thought of as the invention of two young computer whizzes—Sergey and Larry, Larry and Sergey—the truth is that Google is a creation of Larry Page, helped along by Sergey Brin. The pair's mission was "to organize the world's information and make it universally accessible and useful." With a US$1-million loan from friends and family, the inaugural team moved into a Mountain View office by the start of 2000. In 1999, Page experimented with smaller servers so Google could fit more into each square meter of the third-party warehouses the company rented for their servers. This eventually led to a search engine that ran much faster than Google's competitors at the time. By June 2000, Google had indexed one billion Internet URLs (Uniform Resource Locators), making it the most comprehensive search engine on the Web at the time. The company cited NEC Research Institute data in its June 26 press release, stating that "there are more than 1 billion web pages online today," with Google "providing access to 560 million full-text indexed web pages and 500 million partially indexed URLs." Even though Page's new model was unsustainable and led to disgruntlement among the affected employees, his issue with engineers being managed by non-engineering staff gained traction more broadly. Eventually, the practice of only instating engineers into the management roles of engineering teams was established as a standard across Silicon Valley. Page also believed that the faster Google's search engine returned answers, the more it would be used. He fretted over milliseconds and pushed his engineers—from those who developed algorithms to those who built data centers—to think about lag times. He also pushed for keeping Google's home page famously sparse in its design because it would help the search results load faster. Before Silicon Valley's two most prominent investors, Kleiner Perkins Caufield & Byers and Sequoia Capital, agreed to invest a combined total of $50 million in Google, they applied pressure on Page to step down as CEO so that a more experienced leader could build a "world-class management team." Page eventually became amenable to the idea after meeting with other technology CEOs, including Steve Jobs and Intel's Andrew Grove. Eric Schmidt, who had been hired as Chairman of Google in March 2001, left his full-time position as the CEO of Novell to take the same role at Google in August of the same year, and Page moved aside to assume the President of Products role. Under Schmidt's leadership, Google underwent a period of major growth and expansion, which included its initial public offering (IPO) on August 20, 2004. He always acted in consultation with Page and Brin when he embarked on initiatives such as the hiring of an executive team and the creation of a sales force management system. Page remained the boss at Google in the eyes of the employees, as he gave final approval on all new hires, and it was Page who provided the signature for the IPO, the latter making him a billionaire at the age of 30. Page led the acquisition of Android for $50 million in 2005 to fulfill his ambition to place handheld computers in the possession of consumers so that they could access Google anywhere. The purchase was made without Schmidt's knowledge, but the CEO was not perturbed by the relatively small acquisition. Page became passionate about Android, and spent large amounts of time with Android CEO and cofounder Andy Rubin. By September 2008, T-Mobile launched the G1, the first phone using Android software and, by 2010, 17.2% of the handset market consisted of Android sales, overtaking Apple for the first time. Android became the world's most popular mobile operating system shortly afterward. After Schmidt announced the end of his tenure as CEO on January 20, 2011, he jokingly tweeted on Twitter: "Adult-supervision no longer needed." Quartz organizational management reporter, Max Nisen, described the decade prior to Page's second appointment as Google's CEO as his "lost decade." While Page continued to exert a significant influence at Google during this time, overseeing product development and other operations, he became increasingly disconnected and less responsive over time. As Google's new CEO, Page's two key goals were the development of greater autonomy for the executives overseeing the most important divisions, and higher levels of collaboration, communication and unity among the teams. Page also formed what the media called the "L-Team," a group of senior vice-presidents who reported directly to him and worked in close proximity to his office for a portion of the working week. Additionally, he reorganized the company's senior management, placing a CEO-like manager at the top of Google's most important product divisions, including YouTube, AdWords, and Google Search. In accordance with a more cohesive team environment, Page declared a new "zero tolerance for fighting" policy that contrasted with his approach during the early days of Google, when he would use his harsh and intense arguments with Brin as an exemplar for senior management. Page had changed his thinking during his time away from the CEO role, as he eventually arrived at the conclusion that his greatly ambitious goals required a harmonious team dynamic. As part of Page's collaborative rejuvenation process, Google's products and applications were consolidated and underwent an aesthetic overhaul. At least 70 of Google's products, features and services were eventually shut down by March 2013, while the appearance and nature of the remaining ones were unified. Jon Wiley, lead designer of Google Search at the time, codenamed Page's redesign overhaul, which officially commenced on April 4, 2011, "Project Kennedy," based on Page's use of the term "moonshots" to describe ambitious projects in a January 2013 Wired interview. An initiative named "Kanna" previously attempted to create a uniform design aesthetic for Google's range of products, but it was too difficult at that point in the company's history for one team to drive such change. Matias Duarte, senior director of the Android user experience at the time that "Kennedy" started, explained in 2013 that "Google passionately cares about design." Page proceeded to consult with the Google Creative Lab design team, based in New York City, to find an answer to his question of what a "cohesive vision" of Google might look like. The eventual results of "Kennedy," which were progressively rolled out from June 2011 until January 2013, were described by The Verge technology publication as focused upon "refinement, white space, cleanliness, elasticity, usefulness, and most of all simplicity." The final products were aligned with Page's aim for a consistent suite of products that can "move fast," and "Kennedy" was called a "design revolution" by Duarte. Page's "UXA" (user/graphics interface) design team then emerged from the "Kennedy" project, tasked with "designing and developing a true UI framework that transforms Google's application software into a beautiful, mature, accessible and consistent platform for its users." Unspoken of in public, the small UXA unit was designed to ensure that "Kennedy" became an "institution." When acquiring products and companies for Google, Page asked whether the business acquisition passed the toothbrush test as an initial qualifier, asking the question "Is it something you will use once or twice a day, and does it make your life better?". This approach looked for usefulness above profitability, and long-term potential over near-term financial gain, which has been noted as rare in business acquiring processes. With Facebook's influence rapidly expanding during the start of Page's second tenure, he finally responded to the intensive competition with Google's own social network, Google+, in mid-2011. After several delays, the social network was released through a very limited field test and was led by Vic Gundotra, Google's then senior vice president of social. In August 2011, Page announced that Google would spend $12.5 billion to acquire Motorola Mobility. The purchase was primarily motivated by Google's need to secure patents to protect Android from lawsuits by companies including Apple Inc. Page wrote on Google's official blog on August 15, 2011 that "companies including Microsoft and Apple are banding together in anti-competitive patent attacks on Android. The United States Department of Justice had to intervene in the results of one recent patent auction to "protect competition and innovation in the open source software community"... Our acquisition of Motorola will increase competition by strengthening Google's patent portfolio, which will enable us to better protect Android from anti-competitive threats from Microsoft, Apple and other companies". ... I do think the Internet's under much greater attack than it has been in the past. Governments are now afraid of the Internet because of the Middle East stuff, and so they're a little more willing to listen to what I see as a lot of commercial interests that just want to make money by restricting people's freedoms. But they've also seen a tremendous user reaction, like the backlash against SOPA. I think that governments fight users' freedoms at their own peril. At the May 2013 I/O developers conference in San Francisco, Page delivered a keynote address and said that "We're at maybe 1% of what is possible. Despite the faster change, we're still moving slow relative to the opportunities we have. I think a lot of that is because of the negativity ... Every story I read is Google vs someone else. That's boring. We should be focusing on building the things that don't exist" and that he was "sad the Web isn't advancing as fast as it should be" citing a perceived focus on negativity and zero sum games among some in the technology sector as a cause for that. In response to an audience question, Page noted an issue that Google had been experiencing with Microsoft, whereby the latter made its Outlook program interoperable with Google, but did not allow for backward compatibility—he referred to Microsoft's practice as "milking off." During the question-and-answer section of his keynote, Page expressed interest in Burning Man, which Brin had previously praised—it was a motivating factor for the latter during Schmidt's hiring process, as Brin liked that Schmidt had attended the week-long annual event. In September 2013, Page launched the independent Calico initiative, a R&D project in the field of biotechnology. Google announced that Calico seeks to innovate and make improvements in the field of human health, and appointed Art Levinson, chairman of Apple's board and former CEO of Genentech, to be the new division's CEO. Page's official statement read: "Illness and aging affect all our families. With some longer term, moonshot thinking around healthcare and biotechnology, I believe we can improve millions of lives." He [Musk] wants to go to Mars to back up humanity. That's a worthy goal. We have a lot of employees at Google who've become pretty wealthy. You're working because you want to change the world and make it better ... I'd like for us to help out more than we are. Invention is not enough. [Nikola] Tesla invented the electric power we use, but he struggled to get it out to people. [You have to] combine both things ... invention and innovation focus, plus ... a company that can really commercialize things and get them to people. Page announced a major management restructure in October 2014 so that he would no longer need to be responsible for day-to-day product-related decision making. In a memo, Page said that Google's core businesses would be able to progress in a typical manner, while he could focus on the next generation of ambitious projects, including Google X initiatives; access and energy, including Google Fiber; smart-home automation through Nest Labs; and biotechnology innovations under Calico. Page maintained that he would continue as the unofficial "chief product officer." Subsequent to the announcement, the executives in charge of Google's core products reported to then Google Senior Vice President Sundar Pichai, who reported directly to Page. In a November 2014 interview, Page stated that he prioritized the maintenance of his "deep knowledge" of Google's products and breadth of projects, as it had been a key motivating factor for team members. In relation to his then role as the company's CEO, Page said: "I think my job as CEO—I feel like it's always to be pushing people ahead." Alphabet is mostly a collection of companies. The largest of which, of course, is Google. This newer Google is a bit slimmed down, with the companies that are pretty far afield of our main Internet products contained in Alphabet instead. ... Fundamentally, we believe this allows us more management scale, as we can run things independently that aren't very related. Page wrote that the motivation behind the reorganization is to make Google "cleaner and more accountable." He also wrote that there was a desire to improve "the transparency and oversight of what we're doing," and to allow greater control of unrelated companies previously within the Google ecosystem. Page has not been on any press conferences since 2015 and has not presented at product launches or earnings calls since 2013. The Bloomberg Businessweek termed the reorganization into Alphabet as a clever retirement plan allowing Page to retain control over Google, at the same time relinquishing all responsibilities over it. Executives at Alphabet describe Page as a "futurist", highly detached from day-to-day business dealings and more focused on moon-shot projects. While some managers of Alphabet companies speak of Page as intensely involved, others say that his rare office check-ins are "akin to a royal visit". Page is an investor in Tesla Motors. He has invested in renewable energy technology, and with the help of Google.org, Google's philanthropic arm, promotes the adoption of plug-in hybrid electric cars[clarification needed] and other alternative energy investments. He is also a strategic backer in the Opener startup which is developing aerial vehicles for consumer travel. Page is also interested in the socio-economic effects of advanced intelligent systems and how advanced digital technologies can be used to create abundance (as described in Peter Diamandis' book), provide for people's needs, shorten the workweek, and mitigate the potential detrimental effects of technological unemployment. Page also helped to set up Singularity University, a transhumanist think-tank. Google is one of the institution's corporate founders and still funds scholarships at Singularity University. In 2007, Page married Lucinda Southworth on Necker Island, the Caribbean island owned by Richard Branson. Southworth is a research scientist and the sister of actress and model Carrie Southworth. Page and Southworth have two children, born in 2009 and 2011. On February 18, 2005, Page was granted the deed on a 9,000 square feet (840 m2) Spanish Colonial Revival architecture house in Palo Alto, California designed by American artistic polymath Pedro Joseph de Lemos, a former curator of the Stanford Art Museum and founder of the Carmel Art Institute, after the historic building had been on the market for years with an asking price of US$7.95 million. A two-story stucco archway spans the driveway and the home features intricate stucco work, as well as stone and tile in California Arts and Crafts movement style built to resemble de Lemos family's castle in Spain. The hacienda was constructed between 1931-41 by de Lemos. It is also on the National Register of Historic Places. In 2009 Page began purchasing properties and tearing down homes adjacent to his home in Palo Alto to make room for a large ecohouse. The existing buildings were "deconstructed" and the materials donated for reuse. The ecohouse was designed to "minimize the impact on the environment." Page worked with an arborist to replace some trees that were in poor health with others that used less water to maintain. Page also applied for Green Point Certification, with points given for use of recycled and low or no-VOC (volatile organic compound) materials and for a roof garden with solar panels. The house's exterior features zinc cladding and plenty of windows, including a wall of sliding-glass doors in the rear. It includes eco-friendly elements such as permeable paving in the parking court and a pervious path through the trees on the property. The 6,000-square-foot (560m²) house also observes other green home design features such as organic architecture building materials and low volatile organic compound paint. In 2011, Page became the owner of the $45-million 193-foot (59m) superyacht 'Senses', which is equipped with a helipad, gym, multi-level sun decks, ten luxury suites, a crew of 14 and interior design by French designer Philippe Starck. 'Senses' has extensive ocean exploration capabilities, the superyacht was created to explore the world's oceans in comfort and it carries a comprehensive inventory of equipment for that purpose. 'Senses' was built by Fr. Schweers Shipyard in Germany at their Berne shipyard. 'Senses' features a displacement steel hull and a steel/aluminium superstructure, with teak decks. 'Senses' is equipped with an ultra-modern stabilization system which reduces the free surface effect and results in a smoother cruising experience underway. Page announced on his Google+ profile in May 2013 that his right vocal cord is paralyzed from a cold that he contracted the previous summer, while his left cord was paralyzed in 1999. Page explained that he has been suffering from a vocal cord issue for 14 years, and, as of his May 2013 post, doctors were unable to identify the exact cause. The Google+ post also revealed that Page had donated a considerable sum of money to a vocal-cord nerve-function research program at the Voice Health Institute in Boston, US. The program, at Massachusetts General Hospital, is led by Steven Zeitels, the Eugene B. Casey Professor of Laryngeal Surgery. An anonymous source stated that the donation exceeded $20 million. In October 2013, Business Insider reported that Page's paralyzed vocal cords are caused by an autoimmune disease called Hashimoto's thyroiditis, and prevented him from undertaking Google quarterly earnings conference calls for an indefinite period. In November 2014, Page's family foundation, the Carl Victor Page Memorial Fund, reportedly holding assets in excess of a billion dollars at the end of 2013, gave $15 million to aid the effort against the Ebola virus epidemic in West Africa. Page wrote on his Google+ page that "My wife and I just donated $15 million. ... Our hearts go out to everyone affected." PC Magazine has praised Google as among the Top 100 Web Sites and Search Engines (1998) and awarded Google the Technical Excellence Award for Innovation in Web Application Development in 1999. In 2000, Google earned a Webby Award, a People's Voice Award for technical achievement, and in 2001, was awarded Outstanding Search Service, Best Image Search Engine, Best Design, Most Webmaster Friendly Search Engine, and Best Search Feature at the Search Engine Watch Awards." In 2002, Page was named a World Economic Forum Global Leader for Tomorrow and along with Brin, was named by the Massachusetts Institute of Technology (MIT)'s Technology Review publication as one of the top 100 innovators in the world under the age of 35, as part of its yearly TR100 listing (changed to "TR35" after 2005). In 2003, both Page and Brin received a MBA from IE Business School, in an honorary capacity, "for embodying the entrepreneurial spirit and lending momentum to the creation of new businesses." In 2004, they received the Marconi Foundation's prize and were elected Fellows of the Marconi Foundation at Columbia University. In announcing their selection, John Jay Iselin, the Foundation's president, congratulated the two men for "their invention that has fundamentally changed the way information is retrieved today.". Page and Brin were also Award Recipients and National Finalists for the EY Entrepreneur of the Year Award in 2003. In 2015, Page's "Powerful People" profile on the Forbes site states that Google is "the most influential company of the digital era". As of July 2014, the Bloomberg Billionaires Index lists Page as the 17th richest man in the world, with an estimated net worth of $32.7 billion. At the completion of 2014, Fortune magazine named Page its "Businessperson of the Year," declaring him "the world's most daring CEO". In October 2015, Page was named number one in Forbes' "America's Most Popular Chief Executives", as voted by Google's employees. ^ a b c Forbes (2014). "Larry Page". Forbes. Retrieved March 3, 2014. ^ "Larry Page's house in Palo Alto, California". Retrieved May 7, 2016. ^ "Larry Page Profile". Forbes. Retrieved January 5, 2017. ^ a b Amanda Beck; Gary Hill (November 13, 2007). "Google founder Larry Page to marry". Reuters. Retrieved May 15, 2013. ^ The Columbia Electronic Encyclopedia (2013). "Page, Larry". Thefreedictionary.com. Retrieved August 28, 2018. ^ "In The Garage Where Google Was Born". Mashable. September 27, 2013. Retrieved July 20, 2016. ^ "Larry Page". Forbes. Retrieved October 5, 2018. ^ "Larry Page". Forbes. Retrieved March 27, 2019. ^ a b c d e f g h i j k l m n o p Nicholas Carlson (April 24, 2014). "The Untold Story Of Larry Page's Incredible Comeback". Business Insider. Business Insider, Inc. Retrieved February 2, 2015. ^ "Management team". Google Company. Google. February 2, 2015. Retrieved February 2, 2015. ^ "The Marconi Society Fellows". marconisociety.org. Archived from the original on October 17, 2012. ^ Sergey Brin; Lawrence Page (1998). "The Anatomy of a Large-Scale Hypertextual Web Search Engine". Stanford University. Retrieved May 15, 2013. Lowe, Janet (April 22, 2009). Google Speaks: Secrets of the World's Greatest Billionaire Entrepreneurs, Sergey Brin and Larry Page. John Wiley & Sons. p. 22. ISBN 9780470501245. ^ a b Brezina, Corona (2013). Sergey Brin, Larry Page, Eric Schmidt, and Google / Corona Brezina (1st ed.). New York: Rosen Publishing Group. p. 18. ISBN 9781448869114. LCCN 2011039480. ^ Lowe, Janet (April 22, 2009). Google Speaks: Secrets of the World's Greatest Billionaire Entrepreneurs, Sergey Brin and Larry Page. John Wiley & Sons. p. 22. ISBN 9780470501245. ^ Mark Malseed (February 2007). "The Story of Sergey Brin". Moment magazine. Vol. 32 no. 1. Archived from the original on July 14, 2011. Retrieved May 15, 2013. ^ a b Will Smale (April 30, 2004). "Profile: The Google founders". BBC News. Archived from the original on May 1, 2004. Retrieved May 15, 2013. ^ a b c d "Larry Page Biography and Interview". www.achievement.org. American Academy of Achievement. ^ "Alumni newsletter" (PDF). p. 2. Archived from the original (PDF) on May 3, 2013. Retrieved May 16, 2014. ^ Larry Page (2013). "2013 Founders' Letter". Google Investor Relations. Google. Retrieved February 2, 2015. ^ a b c Helft, Miguel (November 18, 2014). "How music education influenced Google CEO Larry Page". Fortune. Time. ^ a b Scott, Virginia A. (October 30, 2008) [First published in 2008]. Google / Virginia Scott. Corporations That Changed the World. Westport, Connecticut; London: Greenwood Press. p. 2. ISBN 978-0313351273. ISSN 1939-2486. LCCN 2008030541. OCLC 234146408. ^ Lowe, Janet (2009). Google speaks: secrets of the world's greatest billionaire entrepreneurs, Sergey Brin and Larry Page. Hoboken, New Jersey: John Wiley & Sons. ISBN 9780470398548. ^ "HKN College Chapter Directory". Eta Kappa Nu. Retrieved September 5, 2012. ^ "Larry Page". americarichest.com. Archived from the original on June 5, 2013. Retrieved June 18, 2013. ^ "The best advice I ever got". Fortune. Time Inc. April 30, 2008. Retrieved February 2, 2015. ^ "Google Faculty Summit 2009: Meet Google Founder Larry Page" (Video upload). GoogleTechTalks on YouTube. Google. October 5, 2009. Retrieved February 2, 2015. ^ a b Brin, Sergey; Page, Lawrence (April 1998). "The anatomy of a large-scale hypertextual Web search engine" (PDF). Computer Networks and ISDN Systems. [Amsterdam]: Elsevier Science Publishers. 30 (1): 107–117. doi:10.1016/S0169-7552(98)00110-X. ISSN 0169-7552. LCCN 86641126. OCLC 884480703. ^ Brin, Sergey; Page, Lawrence (December 17, 2012). "Reprint of: The anatomy of a large-scale hypertextual web search engine" (PDF). Computer Networks. Amsterdam, Netherlands: Elsiver. 56 (18): 3825–3833. doi:10.1016/j.comnet.2012.10.007. ISSN 1389-1286. LCCN sn99047167. OCLC 610365057. ^ a b c d e f g h John Battelle (August 13, 2005). "The Birth of Google". Wired. Condé Nast Digital. Retrieved February 22, 2015. ^ Moschovitis Group. The Internet: A Historical Encyclopedia, ABC-CLIO, 2005. ^ a b c "Enlightenment man". The Economist. The Economist Newspaper Limited. December 4, 2008. Retrieved February 2, 2015. ^ "Wired 13.08: The Birth of Google". wired.com. ^ Malseed, Mark (February 2007). "The Story of Sergey Brin". Moment Magazine. Archived from the original on January 21, 2013. ^ "About - Google". about.google. ^ "Larry Page Profile". Google. ^ Samuel Gibbs (November 3, 2014). "Google has 'outgrown' its 14-year old mission statement, says Larry Page". The Guardian. Retrieved February 2, 2015. ^ "Google Launches World's Largest Search Engine". News From Google. Google. June 26, 2000. Retrieved February 2, 2015. ^ a b c Max Nisen (April 25, 2014). 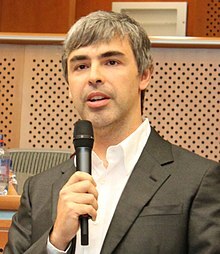 "Larry Page's lost decade was the best thing to ever happen to Google". Quartz. Retrieved February 6, 2015. ^ Efrati, Amir (January 21, 2011). "Google's Page to Replace Schmidt as CEO". The Wall Street Journal. ^ "Management team – Company – Google". Google.com. Retrieved September 28, 2012. ^ American Business BSA Merit Badge Guide, June 22, 2015. ^ Owen Thomas (March 14, 2013). "There's A Pretty Big Tension In How Larry Page Is Running Google". Business Insider. Business Insider Inc. Retrieved February 1, 2015. ^ a b c d Dieter Bohn, Ellis Hamburger (January 24, 2013). "Redesigning Google: how Larry Page engineered a beautiful revolution". The Verge. Vox Media, Inc. Retrieved February 1, 2015. ^ Urs Hölzle (March 13, 2013). "A second spring of cleaning". Official Google Blog. Google. Retrieved February 3, 2015. ^ a b c MIguel Helft (November 13, 2014). "Google's Larry Page: The most ambitious CEO in the universe". Fortune. Time Inc. Retrieved February 3, 2015. ^ a b c d Steven Levy (January 17, 2013). "Google's Larry Page on Why Moon Shots Matter". Wired. Condé Nast. Retrieved February 1, 2015. ^ "Why Google's Larry Page Only Buys Companies That Pass His Crazy Toothbrush Test - Inc.com". Inc.com. ^ David Gelles. "In Silicon Valley, Mergers Must Meet the Toothbrush Test". The New York Times. ^ "Larry Page Toothbrush Test Google Acquisitions - Business Insider". Business Insider. August 18, 2014. ^ Ben Parr (June 28, 2011). "Google Launches Google+ To Battle Facebook [PICS]". Mashable. Mashable. Retrieved February 2, 2015. ^ Robin Wauters (August 15, 2011). "Google Buys Motorola Mobility For $12.5B, Says "Android Will Stay Open"". TechCrunch. AOL Inc. Retrieved February 2, 2015. ^ "Official Google Blog: Supercharging Android: Google to Acquire Motorola Mobility". Official Google Blog. ^ "Google CEO Larry Page explains reasoning behind Motorola acquisition (spoiler: patents)". BGR. ^ Om Malik (May 29, 2012). "Google launches Chromebook, Chromebox & gets it right". Gigaom. Gigaom, Inc. Retrieved February 2, 2015. ^ "Larry Page Quotes". BrainyQuote. ^ "Liveblog: Get the Latest Updates From Google I/O 2013". WIRED. ^ Shara Tibken (May 15, 2013). "Google's Page: We should be building great things that don't exist". CNet. CNet. Retrieved February 1, 2015. ^ Casey Newton (September 18, 2013). "Google launches Calico, a new company tasked with extending human life". The Verge. Vox Media, Inc. Retrieved February 2, 2015. ^ Yarow, Jay (March 20, 2014). "LARRY PAGE: I Would Rather Give My Billions To Elon Musk Than Charity". Business Insider. Retrieved December 28, 2014. ^ "Quote | Invention Is Not Enough. [Nikola] Tesla ..." Retrieved September 12, 2018. ^ a b Nicole Arce (October 25, 2014). "The rise and rise of Sundar Pichai in Google (and Larry Page is loving it)". Tech Times. ^ Rolfe Winkler. "In New Structure, Google CEO Page Aims for 'Faster, Better Decisions'". WSJ. ^ Shreya Shetty. "Sundar Pichai moved up the ladder to head Google's products business - Mobiletor.com". Mobiletor.com. ^ Gabriela Vatu (October 25, 2014). "Larry Page Promotes Sundar Pichai to Chief of Core Google Products". softpedia. ^ a b Page, Larry. "G is for Google". Google Official Blog. Retrieved August 11, 2015. ^ Metz, Cade. "A New Company Called Alphabet Now Owns Google". Wired. Condé Nast. Retrieved August 13, 2015. ^ Page, Larry (August 10, 2015). "G is for Google". Official Google Blog. Archived from the original on August 10, 2015. Retrieved August 10, 2015. ^ Bergen, Mark; Carr, Austin (September 13, 2018). "Where in the World Is Larry Page?". Bloomberg Businessweek. ^ "SiliconBeat: Tesla Motors, new electric sportscar company, raises $40M from Google guys, others". siliconbeat.com. ^ "Opener Announces Silicon Valley Luminary Backing". opener.aero. ^ Larry Page, Sergey Brin and Vinod Khosla discuss their views on the societal impact of technology (July 3, 2014). The audience is composed of the CEOs of the portfolio companies of Khosla Ventures. ^ Ashlee Vance (June 13, 2010). "Merely Human? That's So Yesterday". The New York Times. ^ "Frequently Asked Questions". Singularity University. ^ KurzweilAI. "announcement - Special invitation to apply to Singularity University, featuring full tuition grant". kurzweilai.net. ^ Megan McCarthy (December 7, 2007). "President Bush, Clintons to meet at Googler wedding?". Gawker. Gawker Media. Archived from the original on October 9, 2012. Retrieved May 15, 2013. ^ Ryan Tate (November 6, 2009). "Another Google Heir Is Born". Business Insider. Business Insider, Inc. Retrieved May 15, 2013. ^ "Larry Page Fast Facts". cnn.com. Retrieved June 23, 2013. ^ ": Fall Real Estate 2003 - Palo Alto Online -". paloaltoonline.com. Archived from the original on March 14, 2016. Retrieved September 12, 2017. ^ Jackson West. "Larry Page's $7 million manse". Gawker. Gawker Media. Archived from the original on February 8, 2015. ^ "Cody Anderson Wasney Architects - Waverley Oaks (Hacienda De Lemos)". cawarchitects.com. ^ "Persevering to preserve the past". paloaltoonline.com. ^ "Hacienda de Lemos". pastheritage.org. ^ "National Register #80000863: Lemos House in Palo Alto, California". noehill.com. ^ Owen Thomas. "Google's Larry Page Goes on Eco-Friendly Construction Rampage". Gawker. Gawker Media. Archived from the original on February 8, 2015. ^ "Larry Page to Build New 'Eco-Friendly' House in Palo Alto". On The Block. ^ "Google's Larry Page building eco-friendly compound in Palo Alto". mercurynews.com. ^ "Google exec plans 6,000-square-foot home". paloaltoonline.com. ^ "A yacht to smile about: Billionaire Google founder buys 193-foot boat for $45million ... but he bought it second-hand". Daily Mail. January 12, 2011. ^ "Luxury Motor Yacht 'Senses' - World Cruising Charter Yacht". charterworld.com. ^ Yacht Charter Fleet. "SENSES Yacht - Fr. Schweers Shipyard - Yacht Charter Fleet". yachtcharterfleet.com. ^ Pepitone, Julianne (May 14, 2013). "Google CEO Larry Page has vocal cord paralysis". CNN Money. Retrieved May 15, 2013. ^ Brad Stone (May 14, 2013). "Larry Page Explains What Happened to His Voice". Bloomberg Businessweek. Bloomberg L.P. Retrieved May 15, 2013. ^ Shontell, Alyson (October 17, 2013). "Larry Page Tells Wall Street This Could Be His Last Google Earnings Call For A While". Business Insider. Business Insider, Inc. Retrieved October 18, 2013. ^ "Larry Page - Tech Philanthropists - Donors - Foundations - Inside Philanthropy". squarespace.com. Archived from the original on April 13, 2015. ^ "Google CEO Larry Page Gave $177-Million to Charity Last Month". The Chronicle of Philanthropy. ^ "Larry Page - Google+". google.com. ^ "Google, CEO Larry Page Donate Millions To Ebola Fight". cbslocal.com. ^ National Science Foundation Archived May 13, 2011, at the Wayback Machine, Fellow Profiles. ^ a b "Larry Page". crunchbase.com. ^ "2002 Young Innovators Under 35: Larry Page, 29". Technology Review. 2002. Retrieved August 14, 2011. ^ "15 Local Business Leaders Receive Awards for Their Success in Business And The Community." PR NewsWire, June 23, 2003. Web. April 10, 2015. ^ "American Academy of Arts & Sciences". amacad.org. ^ "Prince Of Asturias Awards 2008". ^ "Larry Page's University of Michigan 2009 Spring Commencement Address=October 06, 2009". ^ "Powerful People - Larry Page". Forbes.com. Forbes.com LLC. 2015. Retrieved February 6, 2015. ^ "Bloomberg Billionaires Index". Bloomberg LP. Archived from the original on December 14, 2012. Retrieved December 3, 2012. ^ Miguel Helft (December 2014). "2014's Top People in Business - 1. Larry Page". Fortune. Time Inc. Retrieved February 3, 2015. ^ "America's Most Popular Chief Executives [Infographic]". Forbes. Retrieved October 23, 2015. ^ "Larry Page di Google cittadino onorario di Agrigento - Tlc". ANSA.it (in Italian). August 4, 2017. Retrieved September 27, 2017. Larry Page at Bloomberg L.P.
Company founded CEO of Alphabet Inc.